Body Contouring has never been easier or more affordable. Most women have cellulite, which, for the most part, cannot be eliminated through diet and exercise. Enter the T-Shock, our device which reduces fatty deposits by using thermal shock to constrict the blood vessels in a localized area. This method is all natural and non-invasive. It induces the break down of fat cells to reduce body fat without damaging other tissues, so there is no recovery time needed. The T-Shock works by alternating warm and cold treatments directly applied to the skin. The procedure is known as contrast cryolipolysis, or fat freezing. Fat cells (in comparison to other tissue types) are more vulnerable to this effect, which causes what’s known as fat cell apoptosis, a natural controlled cell death. The body naturally gradually eliminates the affected fat cells through the lymphatic system. 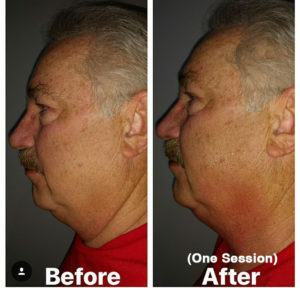 The result: a significant reduction of the thickness of the fat layer. 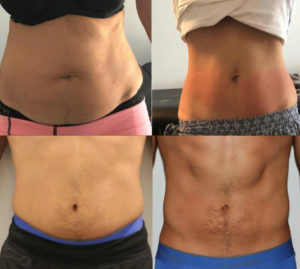 Other methods of non-surgical fat removal primarily involve necrotic cell death, which solely involves damaging fat with heat, high-intensity ultrasound, or chemical injections. Unlike the thermal shock effect delivered by the T-Shock, the surrounding tissue isn’t preserved so the pure reduction of fat cells is not achieved. 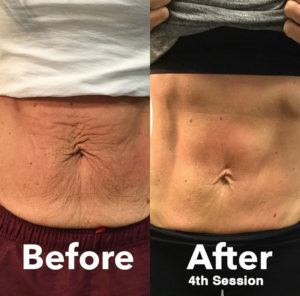 With T-Shock, the reduction of fat with preservation of surrounding non-fat tissue offers a more dramatic firming effect. The T-Shock can also reverse the dreaded skin sag from aging. The shock of alternating between cold and hot temperatures triggers deep layers of collagen back into production. 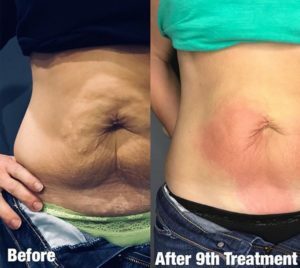 The plumpness and firmness is NOT achievable with other non-invasive techniques. Ready to get started? Call to schedule your free consultation today! Want some proof? See some before/after transformation photos below! Contact us today to get started with your next treatment! We offer a wide variety of cryotherapy services to meet your needs. From salt therapy to pain management, we have a service for you. Utilize our easy to use online booking form and take one step closer to getting a more relaxed version of yourself. Speak with one of our cryotherapy experts and get the advice you need for your next treatment or service. Open 7 Days/Week, Walk-ins Welcome! ***All information contained within this website and on all printed material is for informational purposes only. DO NOT use Cryotherapy to treat any illness or diseases. This treatment HAS NOT been tested or approved by the FDA or any other government agencies. There are no guarantees express or implied. Use at your own risk.